The Apache peoples are made up of a group of American Indian tribes that are similar in culture and speak the same language. There are six tribes that make up the Apache: the Chiricahua, Jicarillo, Lipan, Mescalero, Western Apache, and Kiowa. The Apache traditionally lived in the Southern Great Plains including Texas, Arizona, New Mexico, and Oklahoma. They are closely related to the Navajo Indians. The Apache lived in two types of traditional homes; wikiups and teepees. The wikiup, also called a wigwam, was a more permanent home. Its frame was made from tree saplings and formed a dome. It was covered with bark or grass. Teepees were a more temporary home that could be moved easily when the tribe was hunting buffalo. The teepee's frame was made of long poles and then covered with buffalo hide. It was shaped like an upside down cone. Both types of homes were small and cozy. Most of the Apache clothing was made from leather or buckskin. The women wore buckskin dresses while the men wore shirts and breechcloths. Sometimes they would decorate their clothing with fringes, beads, feathers, and shells. They wore soft leather shoes called moccasins. The Apache ate a wide variety of food, but their main staple was corn, also called maize, and meat from the buffalo. They also gathered food such as berries and acorns. Another traditional food was roasted agave, which was roasted for many days in a pit. Some Apaches hunted other animals like deer and rabbits. To hunt, the Apache used bows and arrows. Arrowheads were made from rocks that were chipped down to a sharp point. Bow strings were made from the tendons of animals. To carry their teepees and other items when they moved, the Apache used something called a travois. The travois was a sled that could be filled with items and then dragged by a dog. When the Europeans brought horses to the Americas, the Apache started using horses to drag the travois. Because horses were so much bigger and stronger, the travois could be bigger and carry a a lot more stuff. This also allowed the Apache to make larger teepees. Apache Still Life by Edward S. Curtis. The Apache women wove large baskets to store grain and other food. They also made pots from clay to hold liquids and other items. The Apache social life was based around the family. Groups of extended family members would live together. The extended family was based on the women, meaning that when a man married a woman he would become part of her extended family and leave his own family. A number of extended families would live near each other in a local group which had a chief as the leader. The chief would be a man who had earned the position by being the strongest and most capable leader. 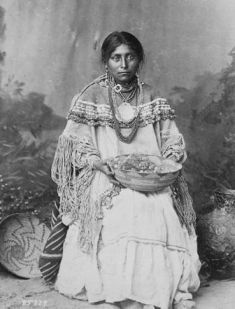 The women Apache were responsible for the home and cooking the food. They would also do crafts, make clothes, and weave baskets. The men were responsible for hunting and were the tribal leaders. 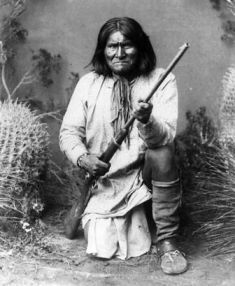 In the late 1800s the Apache's fought a number of battles against the United States government. They were trying to fight back from the aggression and takeover of their land. Several great Apache leaders arose such as Cochise and Geronimo. They fought with ferocity for decades, but finally had to surrender and were forced into reservations. Today many of the Apache tribes live in reservations in New Mexico and Arizona. Some also live in Oklahoma and Texas.